The Episode starts with Jawahar thinking of Hanumant’s words and getting angry. He thinks Hanumant is proud of Kesari, I will show him my move. He puts down Jagat and asks Hanumant did he see. Hanumant doesn’t see. Jagat scolds Jawahar. He asks Hanumant to permit him to fight Jawahar. Hanumant asks them to do warm up. Jawahar thinks Kesari is reason for this. Pandit ji comes home to tell them. Madhavi stops pandit from telling anything. Pandit finds her worried and thinks maybe I shouldn’t tell this to Hanumant. Pandit says my wife isn’t well, if Madhavi can come and help her. Hanumant says sure. He goes. Madhavi asks the matter. Pandit tells her about Kesari. She asks what happened to her. He tells her everything. He says don’t worry, she is fine, she is in temple with my wife, I have come to inform you. She rushes to meet Kesari. She sees Kesari and cries, recalling her words. Kesari gets up and sees Madhavi. They hug. Pandit and his wife smile. Kesari asks Madhavi is she annoyed with her now. Madhavi says no and hugs her. Kesari learns that her monkey friend saved her life. She says I will marry him when I grow up. Pandit laughs. Madhavi thanks Pandit and his wife for saving Kesari. He asks her about Kesari’s disguise. Madhavi says Kesari wanted to go school, she is stubborn, she has done this to study. Kesari apologizes. 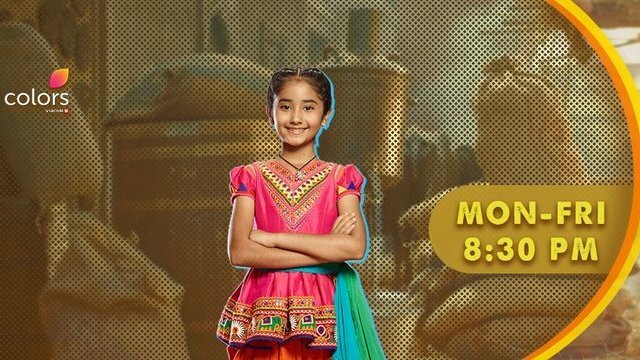 Pandit says you didn’t do wrong, its your right to get educated, I m sure that Kesari will make everyone proud one day, our blessings are always with her. Madhavi says we shall go home now, your dad is waiting. Kesari says he is waiting for Kesari Nandan. Jawahar says that boy won’t come now. Jagat says but why, I thought he will come, he was very confident. Madhavi lifts Kesari and gets her home. She asks Kesari to be strong. Jawahar says that boy didn’t come, will I get a chance to fight Jagat. Hanumant says we will see. Madhavi says your dad can come to room to see you. Choti Maasa asks where is Madhavi. Hanumant says she has gone to meet panditain. He checks some accounts book. He goes to give haldi. Madhavi comes home with Kesari. Jagat doesn’t see them. Madhavi goes to room. She sees Hanumant coming and hides Kesari. He calls out Kesari. They get worried. He doesn’t see Kesari in room. kesari’s dupatta flies off. Madhavi holds it back. He doesn’t see them hiding. He calls out Jagat. Kesari prays that they get saved. Jagat comes. Hanumant asks where is Kesari. Jagat says I haven’t see her, maybe she is on terrace. Hanumant calls our Kesari. She comes to him. Hanumant asks where were you. She faints. They run and hold her. Madhavi comes running. Hanumant asks Jagat to call doctor. Kesari and Madhavi stop Jagat. Madhavi says I will take care of her. Madhavi doesn’t let Hanumant see their wounds. Hanumant sees Kesari ill and says its my mistake, I didn’t focus on anyone since morning, I was thinking of Kesari Nandan, but he didn’t come. Kesari feels bad. Hanumant says that boy didn’t come. Kesari comes to meet him.